Open WOD 19.5 Tips, Mindset, Celebration, & More! It’s the last week of the Open and of course, this one is a doozy! There’s a saying, “if your workout doesn’t scare you a little bit, it’s probably not enough”. There is a precedent for a workout like this in the final week of the Open. 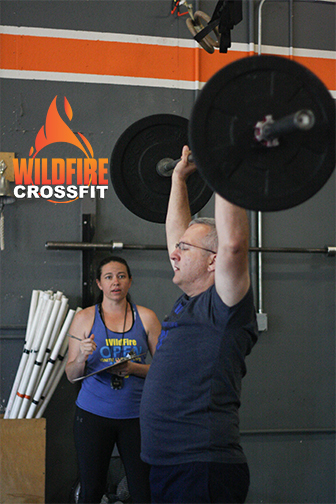 In 2014, WOD 14.5 was 21-18-15-12-9-6-3 of Thrusters (95/65) and Bar Facing Burpees. Unlike 19.5, there wasn’t a 20-minute time cap, and there wasn’t a scaled option for the workout. Athletes had to keep working until they completed it. The first thing you need to do for this workout is go into it with the right mindset. If you psych yourself out before the workout even begins, it is going to be an awful 20 minutes. You must look at this as just another WOD. And, an opportunity for you to rise to the occasion, be mentally tough, and do the very best you can. Whether your goal is to beat Frasier’s time of 6:53 (the guy is incredible, what else can you say) or, get as much work in as possible in 20-minutes, as coaches, we are going to be proud of your effort and you know your WildFire Family is going to be there to cheer you on. While there are a few tips that we will give you, this workout is less about tips and strategy, and more about just doing your best, going into it with confidence, and knowing how great you are going to feel when the time is up that you accomplished something incredible. You CAN do this, just go as hard as you can until you either complete the workout or the whistle blows. THAT is what 19.5 is all about. The first thing you need to decide is whether you are going to do the workout Rx or Scaled. Sure, there are a lot of reps in this workout, however, the 20-minute cap itself makes the workout easier than 14.5 from 5 years ago. You don’t need to go unbroken in either the Thrusters or the Chest to Bar Pull Ups, so as long as you can do the weight and can get your chest to the bar (in other words, touch below the collarbone) you should go Rx in this workout. Even if you are just doing 1 pull up at a time. If you have the weight on the Thruster and aren’t quite there yet on your Chest to Bar Pull Ups, it makes sense to do the workout Scaled. Just make it a goal to complete the workout. First, let’s talk about form and technique. It’s important to use your legs in this workout. Doing a Front Squat and a Shoulder Press is going to burn your shoulders out very quickly. A good rack position is also going to help. Holding the bar out in front of you instead of resting it on your shoulders is going to burn your wrists out quickly, especially during any kind of rest. As for the reps, especially in the first few rounds (33-27-21), be sure to break this up into manageable sets. This is not the workout to go unbroken. Larger sets are obviously going to be better, if you aren’t spending a ton of time resting between them. Descending reps are also going to help you get to the Pull Up bar faster and make the workout feel easier. Here are 3 suggestions based on how many Thrusters you can do unbroken. For example, if you have done “Fran” (21-15-9 Thrusters & Pull Ups) unbroken, go for the first one. If you usually break it up into 2 or more sets from the start, you may want to do one of the other options. Even with these set suggestions, you may need to break it down even more. All good. Just have a plan going in, Plan A, Plan B, and then Plan F.
There are a few ways to organize your rest between sets. Count down from 5 (in your head) taking a few deep breaths to control your breathing. Taking 3 deep breaths and then getting back on the bar. Or, even watching the clock for a specific amount of time. I would suggest 5 seconds, however, no more than 15 seconds between sets. While you can use the same set options for the Pull Ups, you may need to break them into smaller sets. Remember, “No Reps” are going to kill you in this workout. A “No Rep” takes the same amount of energy as a good rep, it just doesn’t count, so, make sure every rep counts. Even if you need to do 1 Chest to Bar Pull Up at a time to get through them, that’s totally okay. Again, just be sure the time between reps is organized. For example. You may do a rep, jump down, take a breath and jump right back up. Then, after every 5-7 reps, take 3 deep breaths before starting the next set. Even though you are doing singles, you can still organize them into sets. Tips on the form is to keep your kip tight. This will create more power and make it easier to get your chest to the bar and takes less energy. Think about a Superman on the ground. You are bringing your thighs and chest off the ground, not bending your knees. Do the same thing with your kip on the Chest To Bar Pull Ups and keep your legs straight when you go into the Superman position on the bar. Also, go a little wider with your hands to reduce the distance. Bottom line with the Chest to Bar Pull Ups is to do whatever you need to do to keep going. If you start getting “No Reps”, take a little longer of a rest before getting back up there. You may even need to change up your grip. It is okay to alternate your grip, one palm forward and the other back. You can even do them with both palms facing you as long as you start from a dead hang with your arms straight, and you touch your chest to the bar, anything else goes. For the Jumping Pull Up, first, your head must be 6 inches below the bar from a standing position, so we will use boxes and plates to help you meet that standard. Next, you must start each rep with your arms fully extended, which means you will need to bend your knees to reach that full extension. Finally, you must get your chin over the bar for each rep to count by simply breaking the plane of the bar. Your chin does not need to come into contact with the bar or even be directly over it for the rep to count. It should be easier to break the Jumping Pull Ups into larger sets since you are coming down to your feet each time. Be sure to swing forward to the bottom, getting to that Superman position, and at the top, push away from the bar. This will help keep your reps efficient. When all else fails, just GO and take a lot of pride in the fact that every coach and athlete at WildFire is SO proud of your effort. While we want you to get the best score possible on very workout you do, at the end of the day, as long as you know you did your very best, you can hold your head high. When it is all said and done, don’t wait until a month before the Open to start working on your skills and strength. Training for the next Open begins on Monday, and while it’s not about the Open, or going to the Games, it’s about setting goals and being the best athlete you can be. With that comes a confidence that you will carry with you in everything you do. And remember, we are always here to help. TOMORROW NIGHT, we are going to be celebrating the end of the Open at CB Live in Desert Ridge starting at 6:30pm. We went last week for the first time and it was a blast. They have live music, great food, and of course, all kinds of good drinks. We have an area reserved for us, so whether you did the Open or not, come celebrate everything you have accomplished with your fitness, and have a ton of fun with your WildFire Family!